It is Sunday again and that can only mean one thing.. It is time to link up with One Dad 3 Girls again for our #MySundayPhoto post. I must say I am really starting to look forward to this post every week. I have been noticing so many picture perfect scenes, places and things this week which I can imagine is going to become a very regular event. It has took me a while to decide which of the photo's I preferred this week but here it is my Sunday photo. I took this photo on Tuesday while we where doing our shopping! Which is one of the last places I thought I would find such a beautiful scene. I just couldn't resist taking this shoot. I love the display of natural colours of the Autumn season. We have still been having some incredibly beautiful days that are bright and sunny. 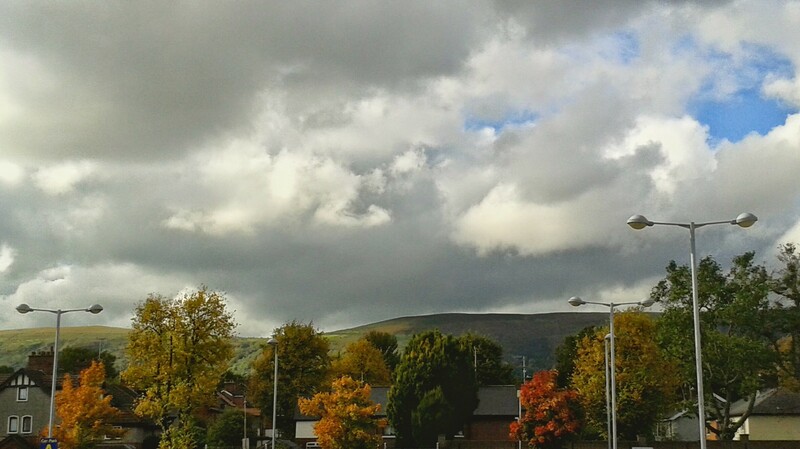 I love how the photo captures the contrast between the light and the dark of the cloud cover on the side of the mountain in the background while the splashes of colour from the tree's display many of the shades of autumn colours. Finally, I like the definition in the shapes of the clouds. I hope you all enjoy this photo as much as I do. What a beautiful scene considering it's somewhere so ordinary! It really brightened our usual shopping trip to see this, it was just beautiful. It just shows that beautiful things are everywhere! Thank you. I think I can now live with the darker nights if this is our autumn days. I just hope they last for a while yet. I am loving linking up and discovering new blogs with some beautiful photography! Thank you for hosting. You know until Tuesday I had never really noticed there where trees there! It was all so beautiful they really stood out. Thank you. I love all the colours too. It is incredible in the sky this autumn!